WANT TO PERFORM FOR HUNDREDS OF THOUSANDS ON THE BIGGEST STAGES?CONSIDERING FULL-TIME TRAINING IN THE FUTURE? DO YOU DREAM OF A CAREER IN THE WEST END? DO YOU NEED TO TAKE YOUR TRAINING TO THE NEXT LEVEL? THEN REGISTER NOW TO AUDITION FOR WEST END KIDS AND JOIN THE UK'S MOST SUCCESSFUL PERFORMANCE COMPANY. West End Kids provides elite "on the job" Musical Theatre training and is, - without doubt - the toughest, most challenging part-time musical theatre training available for talented young performers. If you have a passion for performing and the determination to take your training to the next level then you should consider attending a free workshop audition to find out what it's like to train with West End Kids. There is nothing to prepare for your audition and, if successful - you'll start the following week! The world's best known musical theatre song & dance troupe! An group of exceptionally talented young performers aged 10 to 18 years. The troupe performs for hundreds of thousands of people every year at the UKs biggest venues and events and combines its busy performance schedule with an intensive, Saturday training programme. Think of it as "on the job" training, where every rehearsal is spent preparing for the next performance. West End Kids is ideal for performers looking to gain places on full-time performing arts courses and who are considering a career in the West End. All WEKs attend normal schools and we believe strongly in maintaining a strong academic education until age 18. 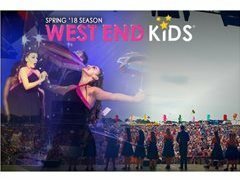 West End Kids also operates WEK: Training, a tough and challenging musical theatre training programme which runs on Saturday's in Central London. WEK: Training is perfect for ambitious, aspiring young performers aged 9 to 18 years. Your biggest ever challenge! Each year West End Kids holds the annual WEK: Summer Intensive, taught by the West End Kids creative team. If you've ever dreamed of being a West End performer or attending full-time performing arts college, the West End Kids Summer Intensive is the week long, residential, intensive summer course for you! The West End Kids reflect individual talent, hard work. athleticism, training, teamwork, dedication and dazzling performance skills. The West End Kids Summer Intensive focuses on and teaches these elements to you! All WEK Companies are made up of performers from throughout the entire UK with one or two travelling weekly from abroad. Typically, they are the most advanced & most ambitious young performers from their area/county.